September 22, 23, 24, 25 & 26, 1970. GP wrote: “I am anti-war! Who isn’t and in their right mind? I am not anti-Haig or any other leader. I am just pro the common soldier and this makes me slightly anti- the establishment. In the Great War the nightmare of life in the trenches with armies locked in frontal struggle, numbed the bodies of the foot soldier but, far worse, numbed the minds of the leaders, who could see no way out of the dilemma except by the weight of men, the expendable commodity! For the glory of their countries [so they thought] men endured hell, because to give in was unthinkable: they sang and they joked, some parodied and some survived. Out of it all, even today, we feel the poignancy of the situation, the self- sacrifice, the nobility – and the waste. I never saw the blood red poppies in the Norfolk barley fields of those days without thinking of ‘the fallen’. On the heathland near my home the rifle butts were a fascination. Whenever the red flags were flying I used to watch the local territorials firing over the bracken and heather at the timber-clad earth banks two or three hundred yards away. [We used to hunt for cartridges and spent bullets.] These were the brave men who survived; the defenders of our world. I have a sort of nostalgic involvement in the 1st World War even though I carried arms in the second. No generation has ever had to face up to the horrors of human slaughter as in 1914-1918 and yet they made tolerable the intolerable by laughing at it. They had the ability to burst out singing. Even the parodied hymns have a religion of their own – they show the indomitable spirit of man. In tonight’s production you will see BRIAN MOULTON tackling a number of parts with relish, a hallmark of this long-standing member. His introduction to the Wick, some 14 years ago, was interesting, because his wife Frances at that time was a keen member, and Brian decided to see what was going on, and has never looked back. He has grown in stature as an actor and has appeared in many leading parts. His favourite was as the father in Anna Christie for which he was named actor of the year in the local press. He still thinks, however, that Wick have never been better than in A Man for all Seasons. This year, for the first time, he has been elected to the committee as Production Manager. This post has been made vacant due to the fact that Terry Mase has a job that takes him away form this area. We feel sure that Brian’s drive and energy will be an asset on committee. In this production we mark another first -the introduction of SHEILA DEASEY on the stage. She has been with the company for three years and for the last two has filled the exacting post of Treasurer. This is not the easiest of tasks, and with out production bills increasing due to the fact that we are endeavouring to present better quality, her job becomes more of a headache. She is another member with a family tradition in Wick as Anthony, her brother is a well-established young actor, and a younger sister, Anne, appeared in School for Scandal. As a member of the audience this last play was one she enjoyed most of all and would dearly love to see The Rivals or The Lark put on. Her first love of the theatre came at school in Worthing, but with only small parts. She works in a bank and lives in Southwick, and let’s hope this is the first of many appearances. Wick Theatre’s first production of the season will be Oh! 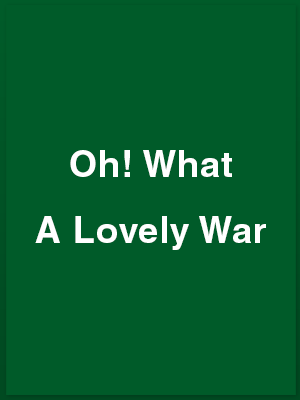 What a Lovely War, from September 22 to 26 at the Barn Theatre, Southwick. This exciting piece of theatre was first performed in 1963 by Joan Littlewood’s Theatre workshop. Together with Charles Chilshop they pierced together songs and war documents of the period and succeeded in creating a unique chronicle of the first world war. The Wick have already performed a shortened version of this for Southwick drama festival and won considerable acclaim. Many of the original cast are in this performance, plus some exciting new talent. The cast is too numerous to name and all have a wide variety of parts to play. Producer is George Porter, with Peggy King on piano and Miranda Bowen coaching and dancing. Pat Moss has designed and made the costumes and handles the box office, so anyone requiring tickets should ring her at Southwick 4114. THE WICK Players’ production of Oh! What a Lovely War at Southwick’s Barn Theatre next week will be quite a family affair, I hear. Four members of one family will be taking to the boards and three other husband-and-wife teams have a hand in the proceedings. STEPHEN and BARBARA MOULTON will play alongside their parents BRIAN [General French] and FRANCES [Mrs Pankhurst] in what will be only the second production of JOAN LITTLEWOOD’S musical on the South Coast. As for the other husbands and wives, former Bluebell Girl MIRANDA BOWEN is responsible for choreography while her husband BARRIE appears on stage as General Haig. And to round things off, producer GEORGE PORTER has found parts for his wife JEAN and JACK and VALERIE BUNGHAM. So it seems that this musical, which will run from Tuesday to Saturday, togetherness will e the order of the day! Despite gremlins, when nothing seemed to go right, Wick Theatre have this week scored their greatest triumph yet, in a spectacular, colourful and scintillating production of Oh! What a Lovely War by Joan Littlewood’s Theatre Workshop. George Porter is responsible for this production which has its final performance tomorrow night [Saturday]. It is a difficult and complex play for a small company of players to put on, but such is the talent and skill of the Wick Theatre Company that every difficulty is overcome and the result is a staggeringly fast moving picture of satire and humour of the dreadful situations in the first world war, with its parody on the leaders of the day. The stature of Brian Moulton as a player is heightened in this production by his tackling a number of pats with relish – particularly that of Sir John French and Kaiser Bill. His wife Frances, another leading Wick player, has a number of parts to play. Their son Steven is also growing up into quite a useful player. Daughter Barbara stepped into the play at the last moment to fill the place of a member who had to withdraw. She deports herself with credit. It is particularly noteworthy that throughout the play, one or other member of this talented Shoreham family appears in every scene. The play opens with a pierrot scene, with all the company dressed in pierrot costume singing old wartime songs, under the direction of Jack Bingham, who is completely at ease as compère and who plays other parts with equal aplomb. Pretty Sheila Deasey, a a member of the company for many years, and treasurer, makes her first appearance on stage. Another newcomer to the company is Hilary Wiltshire, who performs a ballet dance and who is joined by talented Michael Padley in a dance sequence to good effect. Making a guest appearance is Tom Atkinson, of Southwick Operatic Society, who sings Roses of Picardy and another [? cutting torn]. Other parts well played [? cutting torn] Barrie Bowen as Haig, David Creedon as a chaplain, with songs delightfully sung by Jean Porter and Valerie Bingham. Cameo-style sketches in typical theatre workshop fashion were hilariously funny and with the players all playing so many varied parts, it created an impression of having seen scores of people and many spontaneous bursts of applause came from an appreciative audience. Strong support also came from Mike Donkin, Tom O’Donovan, Neil Shephard, Sue Brown, Joy Talmage and Sue Welton. Special mention should be given to Peggy King, pianist, and Mike Urry, on the drums. Other credits should go to Pat Johnson, Ralph Dawes, Sally Bacon, Margaret Davy, Frances Thorne, Terry Gibbs, Richard Porter, Miranda Bowen, Frank Hurrell, Pat Moss and Carol Brand, all of whom worked so hard back stage and front of house to make the a show such a resounding success. You have two more opportunities, tonight and tomorrow, to see a very fine show at the Barn Theatre, Southwick, where at 7.45p.m., the Wick Theatre Company are presenting Oh! What a Lovely War. The “Pierrots”, all of whom assume a variety of characters in this satirical, at times cynical, but mostly amusing charade on World War 1 are Valerie Bingham, Sue Brown, Sheila Deasey, Hilary Goldsmith, Frances Moulton, Jean Porter, Joy Talmage, Sue Welton, Hilary Wiltshire, Jack Bingham, Barrie Bowen, David Creedon, Mike Donkin, Brian Moulton, Steven Moulton, Tom O’Donovan, Michael Padley and Neil Shepherd with some songs from Tom Atkinson. There are two ways in which this production, which was initially evolved from a theatre workshop improvisation, can be directed. It can be done in a spiteful way or, as George Porter has directed this production, in a more-in-sorrow-than-in-anger way. This way is immeasurably more effective and affecting. It would tend to unfairness to pinpoint any individual performances as, although, in the nature of things some artists have greater responsibilities than others, all do so well in their respective characterisations. The music is supplied by Peggy King on the piano with properly subdued and expert assistance from Mick Urry on the drums. Stage management in this play is intricate and so a special word of congratulations to Ralph Dawes and to Sally Bacon who assisted him. Terry Gibbs has provided some telling sound effects. To sum up, this is a fine example of the best kind of team work.